Historian Powell Casey extensively researched the history of Military Road (La. Hwy. 21) and once gave a presentation to the St. Tammany Historical Society detailing his findings. He later published a more extensive report in a statewide historical publication, and I wrote a newspaper article summarizing it. Click on the image of the article below to view a larger version of the article, which was published in 1974. A text version of this article is found below. The history of Military Road has become of heightened interest locally and throughout the state, and historian Powell Casey recently published an article in the publication "Louisiana History," concerning it. The MilitaryRoad known as "La. 21," that comes through Covington from Bogalusa and extends down to Madisonville, played an important part in local history, especially around the war of 1812. 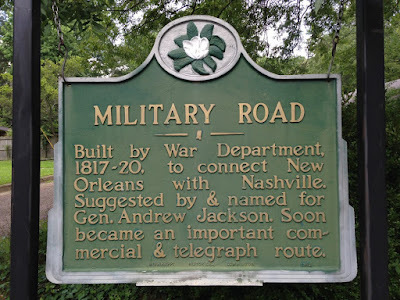 In his article, he noted that fifty years ago, there were three routes in Louisiana that went under the name of Military Road; these three were General Wilkjnson's Road, General Carroll's Road and General Jackson Road from New Orleans to Muscle Shoals. It was the third one which transverses St. Tammany Parish. Casey explains that when U. S. troops under General Leonard Covington took possession of Baton Rouge in December of 1810, better communication between New Orleans and federal officials on the east coast seemed possible. Once the Florida parishes were taken from the Spanish controlled West Florida, the U. S. tried to strengthen its position by building forts and improving roads throughout the area. While old established In­dian trails provided much of the overland routes from the east coast westward there remained a lack of direct routes to New Orleans from the frontier of Tennessee. "Although Spain protested American acquisition of Louisiana," Casey writes,-, "the Spanish governors had. permitted American mail-riders to go to New Orleans via Baton Rouge or via Madisonville and across Lake Pontchartrain." The numerous swamps in the area inhibited vehicular traffic, however. Though sometimes hostile Indians caused problems in establishing horse trails, the government finally got an agreement with the Creeks. Chickasaws, and Choctaws to use some of their trails as horse paths. It was also arranged that the Natchez Trace could be used as a wagon road. Once the Creeks were defeated by troops in 1814, the path they had designated became a vehicular road, also. Slowly, the clearing out and improvement of a road from Baton Rouge to Muscle Shoals, Tenn., was started. The road headed west from Baton Rouge to the Tchefuncte River then headed north to the in­tersection of the Bogue Chitto and Pearl River; from there it went northward to Tennessee. Early maps show the road running from Baton Rouge and St. Francisville eastward to the site of the old St. Tammany courthouse. A number of old military records fail to show the route as accurately as historians would like, and it is believed that another road began somewhere between the Tchefuncte and Tangipahoa River and headed north towards Natchez. As a result, some confusion still stands as to where some of the roads were located. 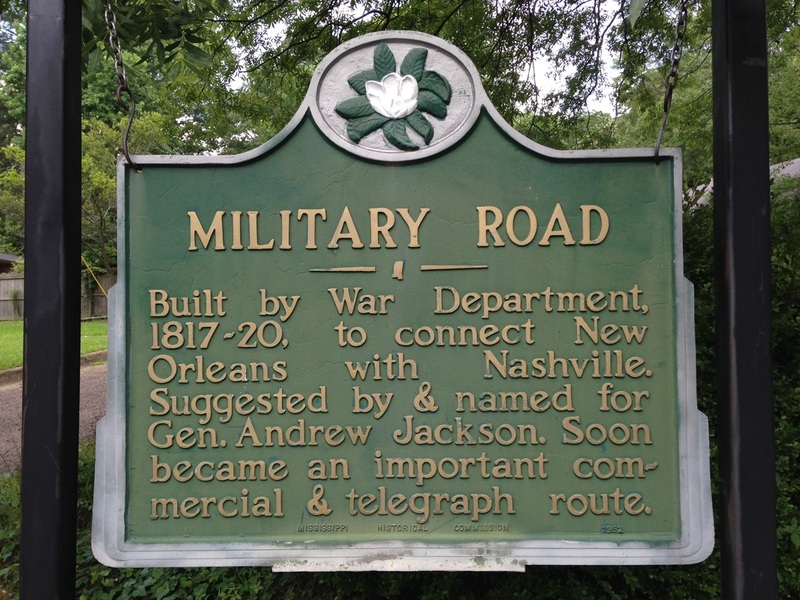 The Military Road bearing Jackson's name was so en­titled because he was the one who had it built, not because he used it to return his troops from his victory in New-Orleans, Casey says. Instead, records indicate that Jackson left New Orleans via the river road next to the Mississippi. This round-about way of leaving New Orleans reportedly convinced Jackson that a more direct way to get to the city was needed. In a letter to the secretary of war in 1815, Jackson wrote of a need for a road to, transport men and supplies from the Tennessee River to New Orleans, a direct route, he noted which would save 300 miles. Jackson was to select the route which would facilitate the movement of troops. The building of the road would be a way to keep his troops occupied, also. Congress, in April of 1816, appropriated $10,000 for the repair and maintenance of two roads, one from Tennessee to New Orleans, presumably Jackson's Road, and another from Fort Hawkins, Georgia, to Fort Stoddert. It was estimated that the building of roads at that time ran something like $200 a mile, including bridges, Casey reported. By November of 1819, the road had been completed for 125 miles, extending from Muscle Shoals to Columbia, Miss., where a military ferry was established. Slow progress brought the road to the Mississippi-Louisiana line and the Pearl River by July of 1819. Then began the long effort at taking the road on to Covington, a 75 mile stretch. Log jams of timber debris prevented supplies from getting up the Pearl River, and it took 12 days for a three yoke ox cart to make the round trip to Covington for supplies. To further complicate matters, negotiations with Spain were deteriorating, and the secretary of war told Jackson to be ready to move against Pensacola should hostilities break out. The Congress had also cutback the appropriations for completion of the road. The secretary of war warned that if the road was not completed soon, the troops would be recalled and the work suspended. On July 8, 1820, General Jackson reported to Washington that the road had finally been completed, Casey notes. It covered 483 miles from Madisonville to Nashville, allowing mail to be delivered from Washington to New Orleans in a mere 17 days. Jackson, in a letter, predicted that the route would become the most important road in America, implying that it would save the lives of many citizens by affording places of shelter and places of aid for the sick traveler. Casey goes on to report that the southernmost 120 miles of the road crossed 25 streams and that 12,000 feet of causeway were installed through low areas. Once the road was completed, it was recommended that more steamboats be put into service between Madisonville and New Orleans. In 1821, the U. S. acquired Florida, and Jackson's road lost, its importance as a military road. It continued to serve as a mail route, however, and was kept in good repair. After that, local residents were put in charge of keeping the road in shape, with an 1822 state legislative act calling upon all persons living within five miles of Military Road to perform repair work on it. Changes in settlement patterns and reforestation programs have all but obliterated some military roads, Casey comments, but "when one crosses the Tchefuncte River at Covington and travels northeastward along La. 21 and La. 1082, he can be sure of being on "the Military Road."